So easy to use. 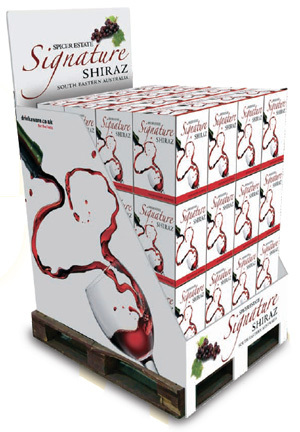 Our pallet wrappers enable retail products on any size of pallet to be merchandised instantly without having to unpack and re-shelve the individual items. The time saving is tremendous! Flexibility. Although our normal wrappers are designed for the most common pallet base sizes (0.6 x 0.8m and 1.2 x 1.0m), we can produce practically any size required. Prototyping service. Using wide-bed inkjet technology, we can produce cost-effective prototypes to 'prove' your design before litho printing a larger quantity. We would always recommend a prototype where considerable quantities of pallet wrappers are to be ordered. Free advice. Please get in touch if you have any questions about how to prepare the design of your wrapper and we will be more than happy to help. Pallet wrappers are despatched within 8 days (quantities up to 100; please contact us for turnaround on larger quantities). Pallet wrappers are standard rated for VAT. 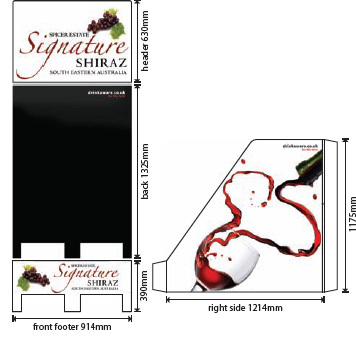 We can supply a kit of PDF templates of the various components of the pallet wrapper by email. The back section (shown in black on the right) is supplied unprinted. Please contact us to receive the set of design templates by email.